Citroën C-Zero is the all-purpose city car (Length 3.475 m - Width 1.475 m - Height 1.61 m - Wheel-base 2.550 m - Payload 385 kg). With a sleek design with fluid rounded lines, a slightly curved roof arch, a shortened bonnet and large windows, the C-Zero is a city car of daring design, matching your corporate image. 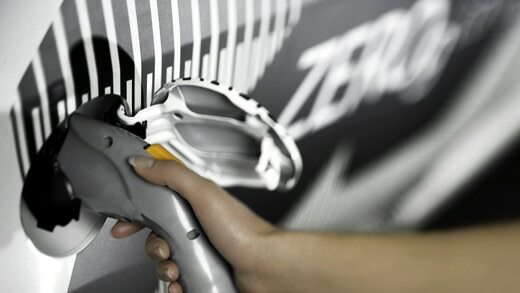 Working with C-Zero you will discover that an electric engine actually frees up a lot of space. Despite its small size, C-Zero is a true four-seater car with a practical 166-litre boot. Whether you're a deliverer, courier or florist, C-Zero is the 100% electric solution for all urban mobility. Its small size allows it to be parked anywhere, while rapid recharging and sufficient autonomy allows it to make all daily trips. This is the ultimate city car! Forget petrol stations! C-Zero is powered by a 49 kW (67 hp EEC) electric engine powered by a 14.5 kWh capacity lithium-ion battery, guaranteed for 8 years or 100 000 km. The battery supplies the energy needed to power the engine as well as the air conditioning and heating system. With a maximum speed of 130 km / h and a range of 150 km, there is more than enough here to cover daily trips. • To start the car: just turn the ignition key. There is no engine noise, just a beep that tells you that your car is ready to go. • To drive: there is an accelerator pedal and a brake pedal. • Range: an indicator keeps you informed of your consumption and even your energy generation, allowing you to adapt your driving to optimise battery performance. By connecting the supplied cable to a simple 220-volt outlet, Citroën C-Zero recharges in 6 to 11 hours (depending on the current available). Charging time is just 30 min (to 80%) with a dedicated terminal. During deceleration phases, Citroën C-Zero engine functions as a generator and converts the kinetic energy of the vehicle into electric energy to recharge the battery.